You know that scene in the last season of American Horror Story where the cannibal family, the Polks, start seasoning Lee’s leg in preparation to eat it? Sorry to bring up that seriously disturbing image but that basically sums up what a churna pinda swedana ayurvedic massage feels like. It is as if your flesh is being tenderized to be prepared before being baked in an oven. Let me explain. Churna pinda swedana massages are part of the Ayurvedic medical practice. This particular whole body massage lasts for an hour, but you may want it to end sooner, as it seriously hurts! And I am the type who asks a masseuse to go so deep they leave bruises. But the pressure isn’t what is painful about this massage, it is the burning heat. The process induces perspiration that sheds the body of unwanted toxins. I discovered this myself while trying a variety of ayurvedic massages during my three-week stint in Rishikesh, India practicing yoga at an ashram. For around $10 for each hour-long massage, I could not resist trying the various ancient treatments. 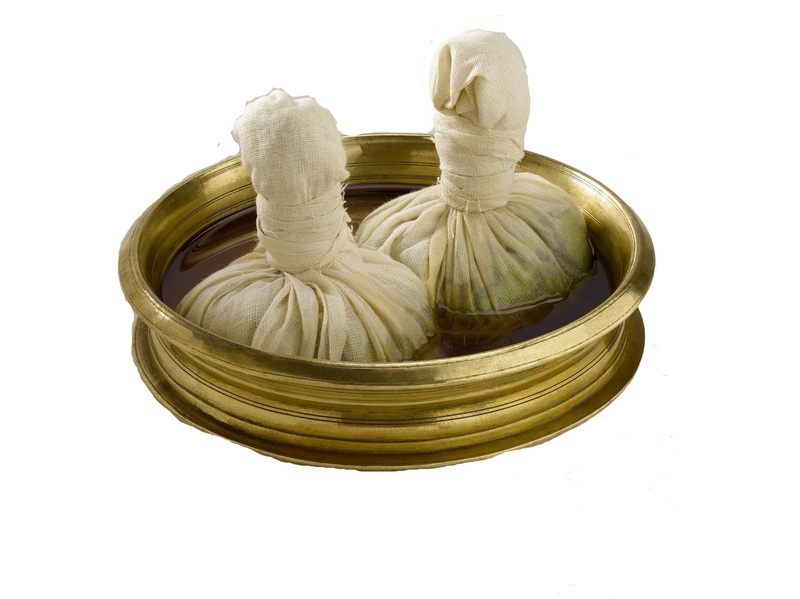 The cloth bundle used in pinda swedana massages is stuffed with medicinal herbs, leaves, seeds, and sticks, such as ginger, lavender, black gram, and gingley seed. It is warmed by being pressed against another cloth bundle that has been sitting in flames and is soaked in oil. The herb bundle is rubbed against the warm one to absorb heat and oil and the immediately punched, pounded and pushed in circular patterns vigorously across the body. The rhythmic pattern doesn’t have a chance to become soothing because you can start to anticipate the next section of flesh that will burn as the bundle touches the skin. This style of massage is meant to be good for easing muscular pain, soothing the joints, and relieving the body of stiffness. All things my body desperately needed after practicing yoga for over 3 hours a day for two weeks! I left my pinda sedana massage feeling bruised, yet soft, silky, yet stinky. The odor of the heated herbs was so strong it actually made my stomach rumble for lunch. You’re not allowed to shower for a few hours after having a heated massage so I went about my day smelling like seasoned meat. The next day my yoga practice was deeper than ever and my lower back and shoulders were not causing me as much pain as they had before the treatment. The verdict? Although this massage was strange and somewhat painful I would absolutely do it again. Experiencing local wellness methods is one of my favorite ways to get in touch with the culture of the country I am visiting. Tell me in the comments what has been the strangest massage you have ever received, or even which was the best? I still fantasize about the coconut husk body scrub massage I had in Northern Thailand that left my muscles soothed and my skin silky smooth. Another personal favorite was a Tibetan pressure point massage I got in the Himalayas.